Our premises are often hired for musical events, sports and educational activities, meetings, sales of work and exhibitions. 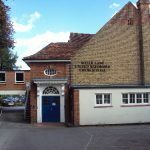 Water Lane URC is an ideal venue for concerts, presentations and lectures. The Church holds up to 350 people including the gallery. 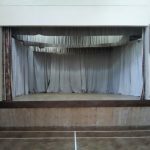 The pulpit, altar table, lectern and front pews can be removed to reveal a large raised dais and performance area suitable for seating, staging, dramatic presentations or recitals. We welcome musicians who will enjoy playing our fine English organ installed by William Hill and renovated by Hill, Norman and Beard. The sanctuary has a good sympathetic acoustic and we have installed a sound system and hearing loop. 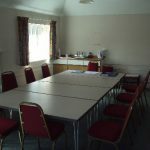 The Welcoming Area and Vestry are suitable for smaller meetings, refreshments or break-out areas. Other facilities include a modern kitchenette and accessible toilets. For more details and hire charges contact the lettings secretary. 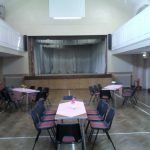 The Church Hall a short distance from the Church is also available for private bookings. 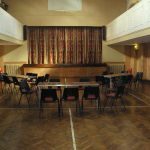 It comprises a large main hall with stage, fitted kitchen and toilets, A number of rooms of varying sizes suitable for a variety of activities, training, exams, meetings or committees are also available. Contact the lettings secretary for more information and availability. Hiring rates are competitively set. The Church has a large sanctuary with pews on ground and balcony levels suitable for seating about 350 people. The raised dais area to the front of the church can be cleared of furniture to create a large performance space. The size of this area can be increased further by the removal of some pews, if required. The dais area would also be suitable as an area for a panel for public or private meetings, talks or conferences. There is a fine organ that can be used for musical performances. A sound system is also provided for the amplification of speech and sound. The Church also has installed a loop system for the hard of hearing. 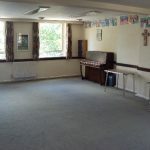 The entrance area of the Church, known as the Welcoming Area, is separated from the sanctuary by a glass screen and provides another venue suitable for smaller meetings, breakout groups or as a refreshments area served by the adjacent kitchenette. The Vestry adjacent to this area provides a private area suitable for meetings, discussions groups or changing rooms. The Church is well provided for in terms of modern toilets for both able and less able individuals. The Welcoming Area The modern entrance area (9m x 9m approx) of the Church provides a tranquil environment for meetings, discussion groups or presentations. The Welcoming Area is separated from the sanctuary by a glass screen creating a light airy and attractive space. The Church Kitchen (7m x 1.5m approx) can be found off the Welcoming Area as can the toilets. 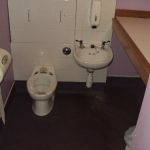 The Church is well provided for in terms of modern toilet facilities with five toilets in their own lockable rooms including an accessible toilet and baby changing facility. 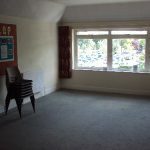 The Vestry (10m x 3m approx) is a good size modern room off the Welcoming Area. It is located at the front of the Church with windows looking over the Church Garden to Water Lane. It is ideal for small groups, interviews, or one-to-one consultations. The balcony at the first floor level is open to the sanctuary but could be used as a breakout area for a number of small groups or for an activity that is not affected by noise coming from downstairs and vice versa. The sound desk facilities are located on this level and can be used by prior arrangement to amplify sound throughout the Church or to record sound. The second floor balcony is not open to the public for health and safety reasons. Main Hall: The high vaulted ceiling main hall (14m x 9.5m approx with 2.3m clearance under a 2m wide balcony) has a wood floor with level access to all main areas. 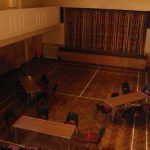 The Hall is a good venue for activities such as badminton, yoga, aerobics, keep fit and young children’s activities, birthday parties and other celebrations. 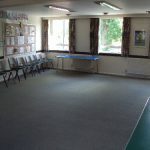 There is a creche area (4.5m x 6m approx) with a separate low level toilet and sink and a baby changing platform available adjacent to the Hall. We have about 120 chairs avaialble for use. Stage: There is a generous proscenium stage with heavy stage curtain suitable for dramatic performances. 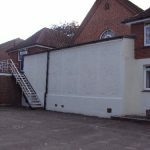 The acting or playing area is approximately 7m by 4m and around 3m high with fly space. A small parallel up-sloping apron projects forward from the stage about 1m above the house floor level. Curtain walling separates the backstage areas providing a crossover area to the rear of the stage and offstage wings for props and technical equipment. A control tower is to be found off right and some technical equipment is already in-situ. There are dressing or green rooms (Beginners’ room and the Crèche) accessible to the left and right of the stage. 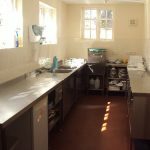 Kitchen: The kitchen facilities are are suitable for the preparation of refreshments and meals. 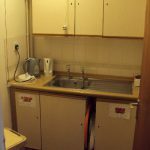 The kitchen (9m x 1.5m approx) is equipped with fridge, cooker, hot-water boiler, small dishwasher and microwave oven. 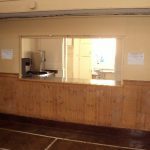 Food and drink can then be supplied to the Hall area via the adjacent servery area (3m x 1.5m approx). There is also a plentiful supply of cups, saucers, plates and cutlery and a wide range of kitchenware is available you may, of course, bring your own. There are plenty of folding table and stack-able chairs. Two types of table are available: square tables around which four people can sit, and long tables which seat eight. The Hall has a generous provision of Ladies and Gents Toilets with room for changing and hanging of clothes. Also off the Hall is an accessible toilet this separate facility also includes baby changing facilities. The New Room – The New Room (9m x 6m approx) is a large light airy space. 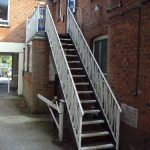 This room can be used independently of other activities in the main hall with access by means of an external metal staircase. A toilet and small kitchenette (1.5m x 1.5m approx) for the preparation of teas and coffee is located in the nearby corridor and is shared with The Parlour. 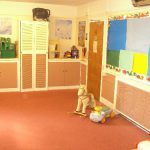 This room is regularly used by music group for toddlers. A piano is located in this room. 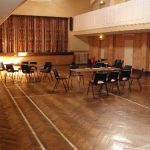 The Lounge – The Lounge (7m x 4.5m approx) makes an ideal large meeting or committee room also suitable for small discussion, activity, light music or craft groups. 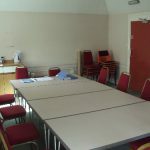 The Parlour – The Parlour (6m x 4.5m approx) is another well proportioned meeting or activity room. This room shares a toilet and the small kitchenette with The New Room. 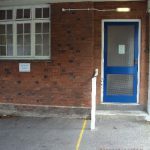 The Beginners’ Room – The Beginners’ Room (7m x 4.5m approx) is another well proportioned room accessed off the main hall or via a separate side door. This room also gives access to the left hand side of the stage for performances. This room can also be accessed from outside independently of the Hall. 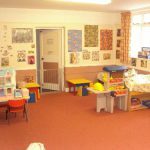 The Creche – As mentioned earlier, The Creche (6m x 4.5m approx) is accessed from the main hall and is well stocked with toys and games for young children. The room has it’s own baby changing and toilet facilities suitable for small children. This room also provides access to the right of the stage for performances.